I made it. Right to the end. I’ve finished Tomb Raider. There were a few little puzzles towards the end, which was really nice. Then a harrowing climb up the citadel to the top, before a battle. This went pretty smooth. The second to last boss, a giant armoured samurai was tough, I think I emptied my entire shotgun, rifle and most of my 9mm into him, before I could get some solid axe strikes to finish him. He was tough and the fight had me leaping about, like the old Tomb Raider. Auto Aim doesn’t work on bosses either. Had me leaping about in my seat too, every time he managed to grab me and toss me across the arena. Now I’ve done the first one and the last one… suppose I should get onto the ones in between someday. I have them all, stashed away. Mostly PS versions I think. Couple of PC. Oh, and this means I can get started on the new PC. I’ll just wait for the fallout on my bike expenses and see where I stand after that. The Red Head mini-boss. Not my picture, this guy did it with the pistol, wow. Read on for my own solution. Tomb Raider is progressing quite well. I adventured off to find some tools to fix a boat. This ended up on the wreck of our first boat, the Endurance. One of the first bad guys I encountered was this large fellow, who appeared could only take damage at the head (hence his “red head” in TR’s Survival Mode view). With my terrible ability at aiming, I was finding myself very quickly overwhelmed and shortly dead. I was starting to look at it being a very frustrating roadblock. Lost another friend in the ship. Having found most of them in the last few “stages” they’re quickly ending up dead. Or kidnapped again, again. So with the boat fixed, I’m off to rescue the Japanese girl again, and hopefully stop whatever has us all trapped on the island. Just over 60% through the game according to the save game. The optional dungeons are the best “dungeon puzzles” so far in the game, but there is the odd “how do I open this” puzzle elsewhere as well. A bit less fighting and more puzzles. Keen to see this story to the end. Nah, haven’t un-un-subbed. Been enjoying Tomb Raider. I’ve made it into the castle, rescued my friends (at least for now I suppose) and managed to get myself out of the pit I ended up in. I’m really enjoying the game, though I still would like a little more “puzzling” out levers and jumps etc. The bow continues to be a strong weapon, though now I’ve moved up from pistol, shotty and have just picked up a grenade launcher so watch out! I haven’t had to fight one of the giant samurai statues, but I’m sure I’ll have to eventually. Finally set my controls up and find fighting achievable. I find the thumbsticks kind of awkward for aiming (in other games too) and so struggled in much of the fighting. But a sort of auto-aim setting, brings it back to almost the original Tomb Raider. The original, Lara tracked her enemies automatically. This one doesn’t track them, but it does auto aim at the enemy when you draw, then you have to track them yourself (or keep drawing). So anyway, it means I’ve been able to push on through the game. And keen to finish that now. Then maybe I should work on Borderlands 2. I want to get into playing MWO, but I need a PC for that. I’m not allowed one of those until I finish TR. That’s the rule. Author MabahoPosted on February 26, 2014 Categories Other Games, PlayStationTags PS3, Tomb RaiderLeave a comment on Grenades! I decided after rather awkward attempt at Eve I should go back and try out some of the single player games that I have stashed about. The Steam summer sales have started too, and whilst I was browsing I remembered that there was a new chapter for The Walking Dead. So I downloaded that and got back into it. Being that it’s just more content, there are still all the same annoying controls in this chapter too. In this one, you play about 5 different people at different points in the 400 days since the infection. 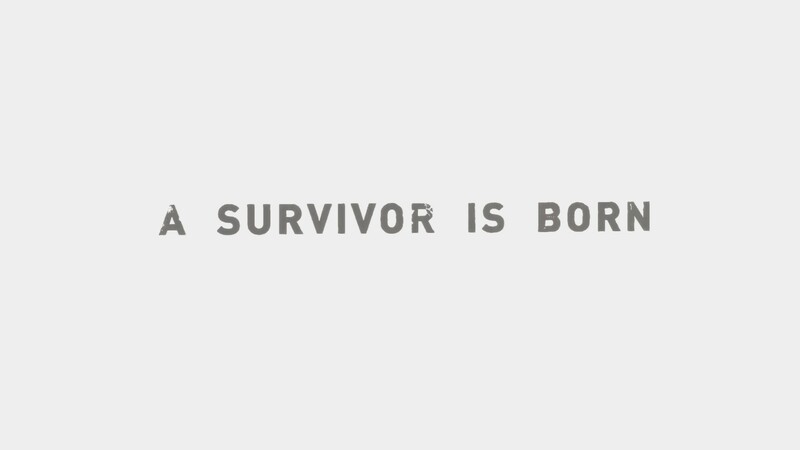 I’ve played two so far – an convict escaping death at the outbreak and a woman forced into some difficult choices about 250 days in. I wonder if they’ll give use one as a zombie?? That would be unusual. It is more of the same so, if you loved the other chapters, you’ll love this one. I am still ambivalent really, though I guess, more on the positive as I actually spent money on it. This afternoon I warmed up the PS3 with some Tomb Raider. Yes, I used my PS3 for gaming, not as a PVR. When I last left our heroine she was spotlighted and in the open with about 15 guys shooting at her. This set piece took several attempts and a lot of frustration. Very happy when I realised I was through the first wave, because I was pretty sure I could get through the dribs and drabs that would come. Outside it was daytime (answering another question I did have about the game) and I had to get to the top of the radio tower. By using a lot of cover and a fair bit of retreating, I ground through the next set of enemy. Bow is still great at range, better than the submachine gun I’ve picked up. Then it was boss fight time, and I had a guy with a armoured shield and some kind of crude body armour. Bounced a lot of rounds off his shield before getting enough past it to knock him down. Still easier than the set piece. A last survivor and the building was clear. Now it was just to climb to the top of the mast at the top of the island and try to contact help. And that’s where Lara is now. Standing at the very top of the tower, gazing at the dawn. I so wish I could get a screenie there. I still hate the way that aiming is controlled. I’ve noticed its common in several games, as Dust514 uses the same control (with about the same sensitivity) and I just can’t seem to get the hang of it yet. 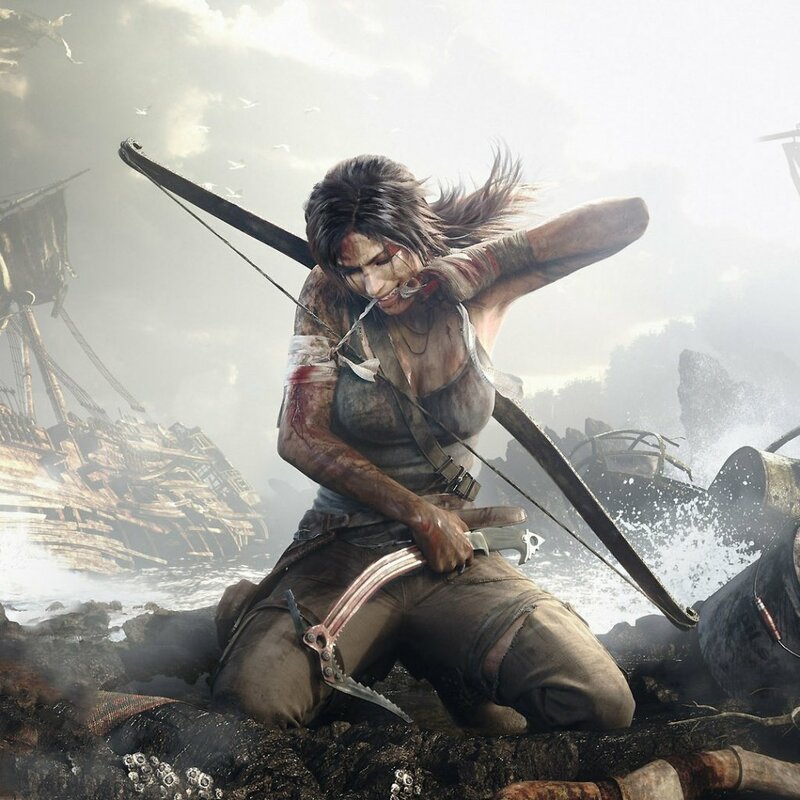 One thing I am liking a lot about this Tomb Raider, hmm actually something I am liking some of the time, is the bow. Now initially when it was my only weapon trying to get a solid kill on a charging wolf was kind of hard. However when you’re sneaking up on a bunch of the islanders, it’s very effective for a quick clean and most importantly quiet kill. I’m on my way up the island to the radio tower (so yes, not very far through the game) and I cleared a whole building without so much as a whisper from the guards. Of course that was pointless when I subsequently had to blow up a wall to get through the next building. I think they heard me as I’m at the start of a set piece with a room full of islanders who all know I’m coming. So far there isn’t the real “Tomb Raiding” feel to the game, but then if it is a reboot as described and this is the tale of how Lara gets that confident then I suppose its to be expected. Some of the hidden areas seem like they will lend themselves to more jumping and guessing than the main path currently does. The main storyline is a lot more action orientated than I expected. Again, I’m only something like 10% into the game. Adding in the sneaky Lara, reminds me of one of my other most favourite games, Tenchu: Stealth Assassins (on PS1). I used to spend long minutes, real time, with my ninja completely still, usually hanging from a cliff edge or perched on a roof, watching the guards as they did their routines. The game did have a some randomness, but not totally – if you waited long enough patterns emerged and you could sneak past or go in for the silent kill. I am also wondering if it ever stops raining or if the sun ever comes up?? Anyone know a way of taking screenshots from a PS3, I’d love to be able to do that to share with you guys. I think I noted somewhere that my most favourite franchise after BattleTech is Tomb Raider. I am sure many are aware that the new game was released to pretty good reviews. I’ve been eyeing the prices until I found one I was comfortable and picked it up over the week. I well remember the hours I puzzled away at the original and the enjoyment I got from it. I do have all of the games since, but have only played bits and pieces of them but due to other commitments, never finished another. I enjoyed what I did see of them. This one has been no different than that… a lot of fun. It’s early stages is not so much about puzzles and figuring which combinations of ledges to jump to, but I’m hopeful that at least a bit of that will come. This early stages is more about surviving. It’s tough without her trusty automatics though. Trying to line up a charging wolf with a bow is hard work. I think I’ve died every possible way so far except falling too far. I’ve been choked, mauled, crushed by rocks, burned, shot (arrow and bullet) … lol. Having come from a WoW background and the strongest TR memories being the first one in 1997, the graphics have improved… well enormously, lol. On the PS3 the game is very fluid. I hear of some breaks on the PC version, something to do with quicktime events, but I don’t see this on the PS3. The graphics might be weaker, but really I still enjoy the first ones, so graphics isn’t the be all (and never should be). Compared to my most recent The Walking Dead game, this is a lot more of an action game and less of a choose your story one. 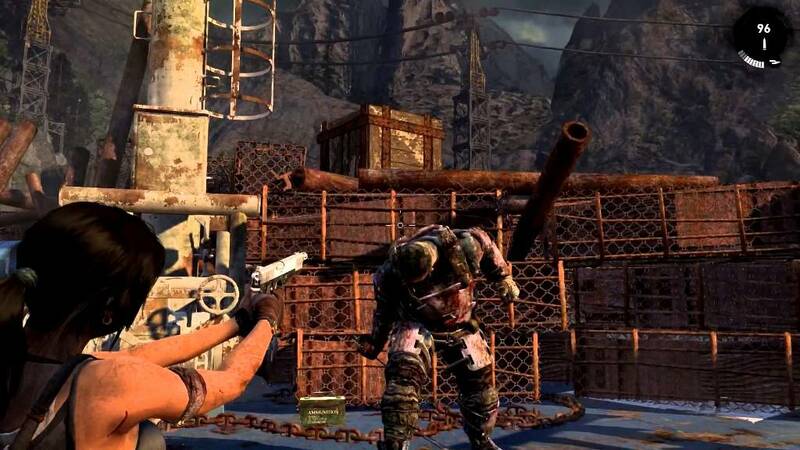 Subsequently there is a lot more to do, and Lara is more directly under your control.